IT was all fun and games at Knockevin School this afternoon as the PSNI arrived for a fun day in the back yard. 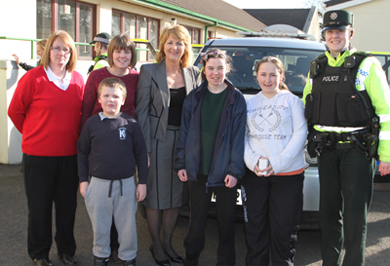 Pupils of Knockevin School in Downpatrick pictured with classrom assistant Alison Synott, teacher Christie Clarke, school principal Ann Cooper and Constable Caroline Owens, Downpatrick Neighbourhood team. Four police vehicles were there – a 1220RT BMW motorbike, a mobile police jail, a Landrover and a vehicle from the Tactical Support Group that has been involved in public order disturbances in Northern Ireland. There was huge excitement in the yard as the pupils posed for photos, tried on helmets, tested shields, checked out the controls of the vehicles and even looked over the handcuffs used for arresting naughty people! UTV were on the scene too taking shots of the pupils having fun and they all loved being on the camera. Following the break in at the school a few months ago and the serious bus crash involving 12 of the school’s pupils this week, this event will be a much needed relief for the staff and pupils.